5793 labyrinths found. Showing 281-300. Sorted by country, state, city, then zip/postal code. To reach Gambier Island, take the Stormaway water taxi from the Langdate Ferry terminal on the Sunshine Coast to the New Brighton dock, on Gambier island. Fiachra's Glebe and it's labyrinth is a 2km walk from there toward West Bay. There is a sign out by the road. 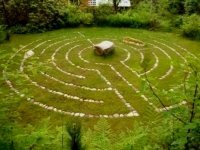 The labyrinth is available to visitors to Gambier Island on most weekends during the spring, summer and fall. 5 circuit inner Chartres labyrinth - 23' diameter, 4" stones inlaid in grass, 16" wide paths, large centre granite stone. The Retreat is located in the village of Honeymoon Bay, 40 minutes from Duncan, BC, through the town of Lake Cowichan and situated behind the Honeymoon Bay Community Hall. Downtown park, to the river, follow trail towards train bridge, trail goes under bridge, keep walking, eventually it's on the right, it's not too big but it's still a nice thing to do if you're in the area. Vimy Park is at the foot of A avenue. Head down to the beach. Walk south down the beach and the labyrinth is in the grasses. You may have to hunt a bit it is not marked at all. Walking south from Kaslo P.O. 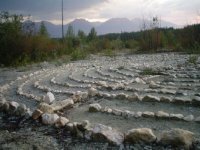 on 5th, past St. Mark's Church, follow signed path up from the road, on way to the Kaslo River Trail, to find the classical labyrinth, all are welcome to enjoy. 50th Ave. & 201A St. Situated on 50th Ave. & 201A St.
Joanna C. Cooke (Bevis) "OJO"
49 6' 31" N° Lat. ; 122 38' 40" W° Long. Travelling North on the Coquihalla (route 5) take the 1st exit to Merritt. That exit into the city becomes Nicola Ave. We are on the right, where the sign on the fence says: THE GATHERING PLACE 2263 Nicola. Coming down the Coquihalla from the north take the second Merritt exit. Parking in front of the house. 50.20 N° Lat. ; 120.40 W° Long. Simple circle labyrinth made of round concrete paving stones set into the ground in the churchyard between the church and the parish hall. Located on Vancouver Island. From Victoria north 40 km via Hwy #1, or from Nanaimo, south 64 km via Hwy #1. At Mill Bay turn west on Shawnigan Mill Bay Road and proceed for 0.7 km to Sylvan United Church. Labyrinth is located behind the church. N 48 39.535 ° Lat. ; W 123 34.282° Long. Off of the #18 exit on the Nanaimo Parkway. Left on Westwood Rd., right on Arbot Rd. Walk Bethlehem Centre’s beautiful outdoor labyrinth. Come explore the Godden Finger Labyrinth Collection. Naramata Centre is a learning and retreat centre of the United Church of Canada, located just north of Penticton, British Columbia on the eastside of Okanagan Lake. Summer Solstice Labyrinth Walk - intentional walks held for every Solstice and Equinox. Check the web-site for dates and times. Labyrinth is open to visitiors - please respect property and labyrinth. 49 29 35.38 N° Lat. ; 117 21 19.04 W° Long.